A lawyer and a blonde are sitting next to each other on a long flight from LA to NY. The lawyer leans over to her, and asks if she would like to play a fun game. The blonde just wants to take a nap, so she politely declines, and rolls over to the window, to catch a few winks. The lawyer persists and explains that the game is really easy and a lot of fun. He explains: “I ask you a question, and if you don’t know the answer, you pay me $5, and vice-versa”. Again, she politely declines and tries to get some sleep. The lawyer, now somewhat agitated, says, “Okay, if you don’t know the answer you pay me $5, and if I don’t know the answer, I will pay you $500”, figuring that since she is a blonde, that he will easily win the match. This catches the blonde’s attention and, figuring that there will be no end to this torment unless she plays, she agrees to the game. The lawyer asks the first question. “What’s the distance from the earth to the moon?” The blonde doesn’t say a word, reaches into her purse, pulls out a five dollar bill and hands it to the lawyer. Now, it’s the blonde’s turn. She asks the lawyer: “What goes up a hill with three legs, and comes down with four?” The lawyer looks at her with a puzzled look. Frustrated, he sends E-mails to all his coworkers and friends whom he knows. After more than an hour, he wakes the blonde and hands her $500. The blonde politely takes the five hundred dollars, and turns away to get back to sleep. The lawyer, who is more than a little miffed, wakes the blonde and asks, “Well, so what IS the answer! 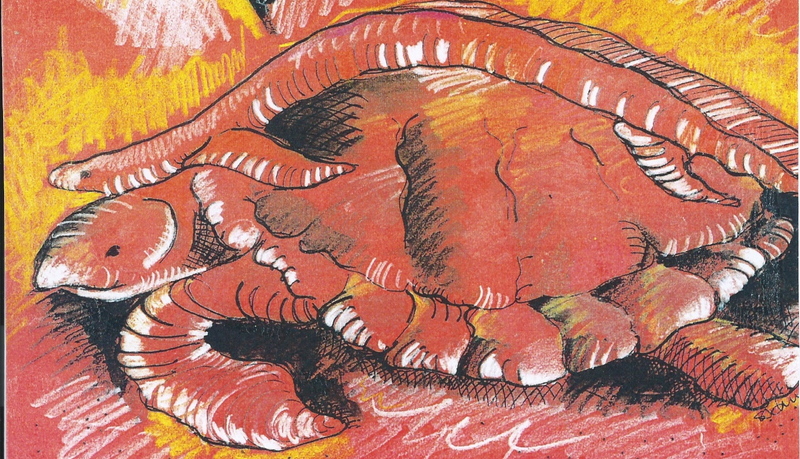 ?” Without a word, the blonde reaches into her purse, hands the lawyer $5, and goes back to sleep! “You shall not move your neighbor’s landmark, which the men-of-old have set, for the inheritance that you will hold in the land, is that which the Lord your God is giving you to possess” – Deut. 19:14. 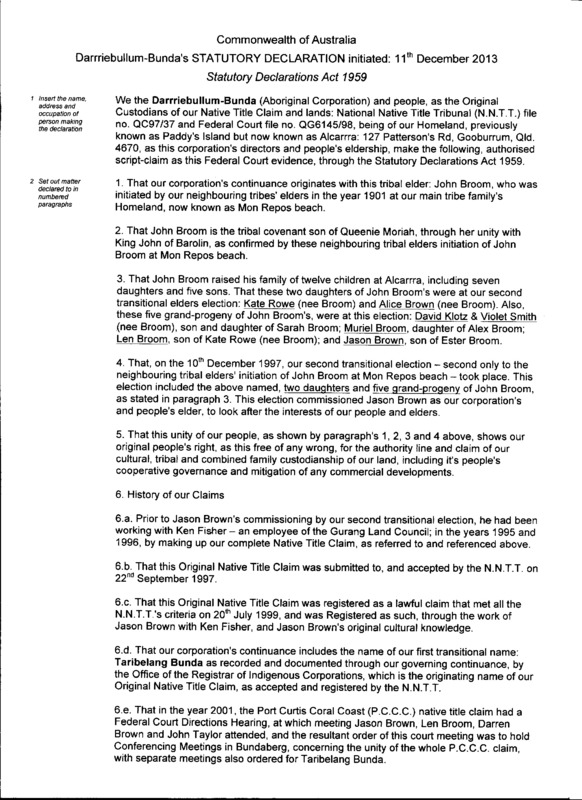 For this picture of our lands and: lands’-original-custodianship-claim, is with the ~Norman: Tindale’s, ~Winterbotham’s &: Gaiarbau’s, and with the ~A.-W.: Howitt’s-cultural-map-making-counsel of our claim’s-counsel, ~together-with our neighbouring-tribe-elders’-counsel, by the counsel of our claims, with our neighbouring-tribe-elders-make of a claim. “Cursed be anyone who moves his neighbour’s landmark, and all the people shall say: Amen” – Deut. 27:17. Such is Moses’ instruction from God, to have the people recite to each other, for Deuteronomy is the second reading of the Law. Cursed be anyone who moves his neighbour’s landmark, and all the people shall say: Amen. “Some people move landmarks; with the purpose of seizing flocks and pasturing them, for their own sake and commercial business” – Job 24:2. “Do not move: the ancient landmark that your fathers have set.” – Prov. 22:28. “Do not speak in the hearing of a fool, for he will despise the good sense of your words. Do not move an ancient landmark or enter the fields of the fatherless, for their Redeemer is strong; he will plead their cause against you” – Prov. 23:9-11. “The princes of Judah have become like those who move the landmark; upon them I will pour out My wrath like water” – Hosea 5:10. An elite-group, gone wrong! A king says to a prophet: “Perhaps I shall be able to defeat these Israelites and drive them from the land, for I know that he whom you bless is blessed, and he whom you curse is cursed” – Num. 22:24. Therefore, don’t “mess with” God’s prophetic people, for anyone should “know that he whom we bless is blessed, and he whom we curse is cursed”, through Abraham’s blessing with us, by our God’s choice – see Gen. 12:3 & Gal. 3:13-14. “Blessed is the one who considers the poor! In the day of trouble the Lord delivers him; the Lord protects him and keeps him alive; he is called blessed in the land; You do not give him up to the will of his enemies. The Lord sustains him on his sickbed; in his illness You restore him to full health” – Psalm 41:1-3. “You shall not wrong one another, but you shall fear your God, for I-Am the Lord your God. Therefore you shall do My statutes and keep My rules and perform them, and then you will dwell in the land securely. The land will yield its fruit, and you will eat your fill and dwell in it securely” … ” “The land shall not be sold in perpetuity, for the land is Mine. For you are strangers and sojourners with Me. And in all the country you possess, you shall allow a redemption of the land”, on the basis of a family’s inheritance and pricing structure – see Leviticus 25:13-28. The year of jubilee is here: Isaiah 61:1-2b ” The Spirit of the Lord GOD is upon me, because the LORD has anointed me to bring good news to the poor; he has sent me to bind up the brokenhearted, to proclaim liberty to the captives, and the opening of the prison to those who are bound; to proclaim the year of the Lord’s favor” …and Luke 4:19 : “to proclaim the year of the Lord’s favor”, when “in this year of jubilee, each of you shall return to his own property and land”, Lev. 25:13. 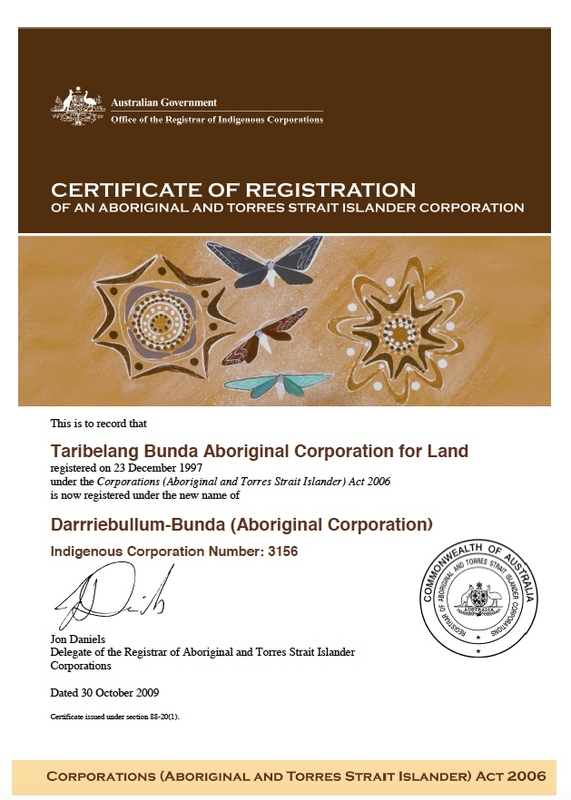 ORIGINAL NATIVE TITLE CLAIM, that can be viewed though the capitalized link, and which-same-claim is perpetuated by our Corporation’s new name – Darrriebullum-Bunda (Aboriginal Corporation), as SHOWN BY THE CERTIFICATE ABOVE. 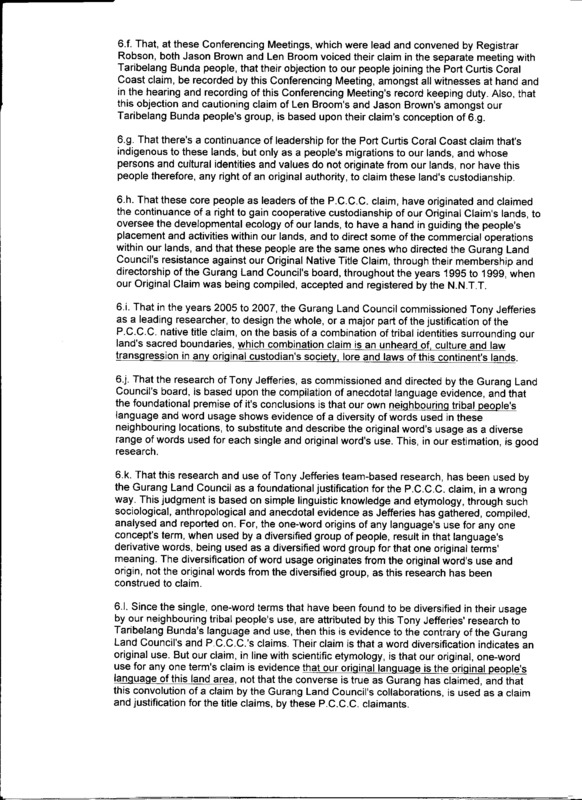 This name-change motion is made with the purpose of separating our native title endeavors and rights, from the bogus claims of the Port Curtis Coral Coast(sic)’s claims, as detailed below. of the Port Curtis Coral Coast(sic)’s non-orlginal claim. 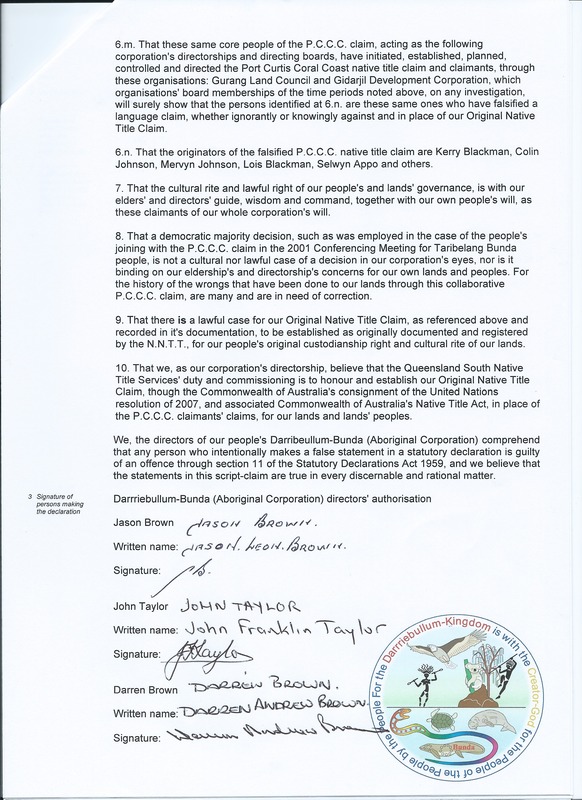 Our recent attendance at the Federal Court hearing on Feb. 13th 2013, for the Port Curtis Coral Coast claim, resulted in us giving this Statutory Declaration to one lawyer of the Queensland South Native Title Services (Q.S.N.T.S. ): Paul Richards; and to one barrister of a Sydney law firm: Tony McAvoy. 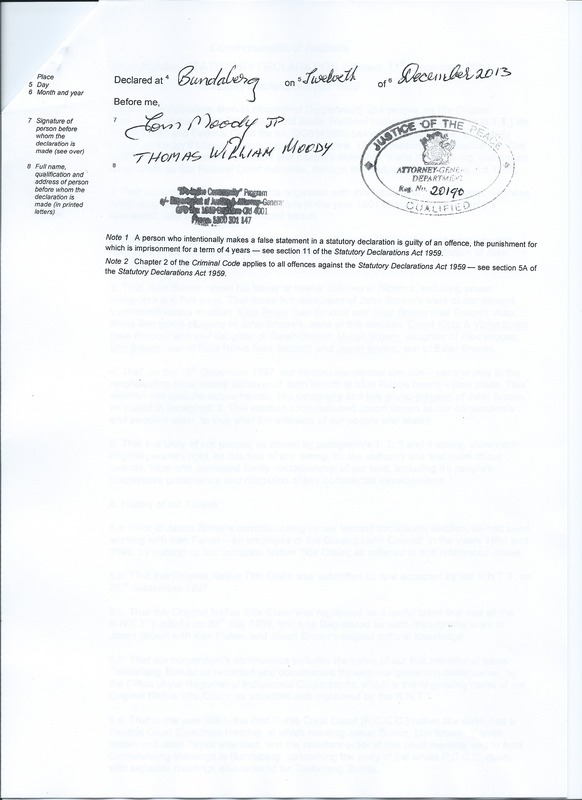 Please enlarge the following pictures, by clicking on them: each-in-order, to read our corporation’s Statutory Declaration.